So the Apple Store Baton Rouge opened last week. I went. Of course. I stood in line with all the other zealots and got my size XL t-shirt. Here is a picture of me, and an unspecified red hooded cutie next to me that someone took at the opening. Seriously, I didn't even know someone was documenting my trip to the Apple Store for me. How nice! I had to find out about it on TUAW.com. Crazy right? 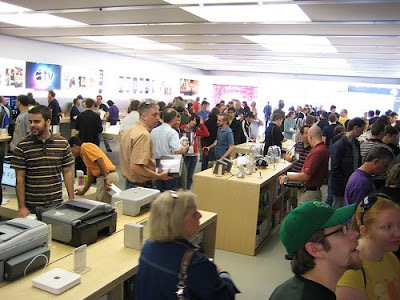 Like all other Apple stores in the country, the staff were some kind of hybrid combination of employees from Best Buy and Urban Outfitters, but with Apple knowledge spewing outta their faces! EDIT: I wrote this about a week ago, but for some reason the Blogger interface was being retarded for uploading images. Now I remember why I use a text editor and upload to the blog directly. WYSIWYG web editors are not my favorite.